In preparation of the funeral, the body of the deceased is washed for cleansing. The methods, styles and cleaning accessories used have varied according to the location. Bathing is a part of the Sunnah of the Islamic prophet Muhammad,and a part of the Islamic Shari`ah. The body is fully covered with a cloth and washed in this manner. The body of the deceased is wrapped in a plain and simple cloth called a "kafan". The process is known as "takfeen". This process is performed to respectfully conceal the private parts of the deceased. The style of wrapping, as well as the material and color of the cloth may vary, but generally, a white cotton cloth is used to dress the deceased. In some instances, a little perfume may be applied to the cloth. Muslims of the community gather to offer collective prayers for the forgiveness of the dead. This prayer is often referred to as The Janazah prayer. The Janazah prayer is offered in a particular way. Like Eid prayer, this prayer is also prayed with extra (four) Takbirs, but there is no Ruku' (bowing) and Sujud (prostrating). Supplication for the deceased and mankind is recited. In extraordinary circumstances, the prayer could be postponed to a later time. After prayer, the body of the deceased is taken to the burial (al-Dafin) site. While there may be variations amongst the site and graves, the Islamic directive is restricted to a respectful burial in the ground, with the grave being aligned perpendicular to the Qiblah (i.e. towards Mecca) and it being raised no higher than 12" above ground level. The body is placed directly into the ground, without a casket. Graves markers for Muslims are kept very simplistic and lavish displays are discouraged. Some graves may either remain unmarked or contain a wreath. However, it is becoming more common for family members to erect grave monuments for Islamic funerals. Only the men are allowed to attend the graveside burial. The body is laid in a manner that allows the head to face Qiblah (Mecca). Each attendee will take a turn in pouring three handfuls of soil into the grave while reciting "We created you from it, and return you into it, and from it we will raise you a second time", Surah 20:55. After this, more prayers will follow asking for forgiveness of the deceased, and reminding the dead of his or her profession of faith. As a final tribute, the Muslims gather and collectively pray for the forgiveness of the dead. 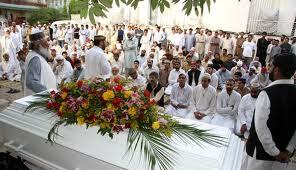 This collective prayer is the last formal collective prayer of the Islamic funeral. 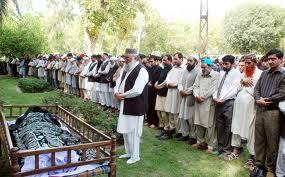 Islamic loved ones and relatives of the deceased observe a 3 Day mourning period. Mourning is observed by increased devotion, receiving visitors and condolences, and avoiding decorative jewelry and clothing. Widows observe an extended mourning period (Iddah) of 4 months and 10 days, in accordance with the Qur'an 2:234. During this period, she may not remarry, move from her home, or wear decorative jewelry and clothing. In Islam, showing grief at a person's death by weeping is acceptable, but to express grief by wailing, shrieking, beating the chest and cheeks, tearing hair or clothes, breaking objects, scratching faces or performing in any manner that is perceived to be outlandish is prohibited. Islamic scholars consider this directive a balance between mourning a husband's death and protecting the widow from censure should she became interested in re-marrying soon after her husband's death. This is also to ascertain whether a lady is pregnant. "And those of you who die and leave widows should bequeath for their widows a year's provision and [bequeath] that [in this period] they shall not be turned out of their residences; but if they themselves leave the residence, there is no blame on you for what they do with themselves according to the norms of society. And Allah is Exalted in Power, Wise."